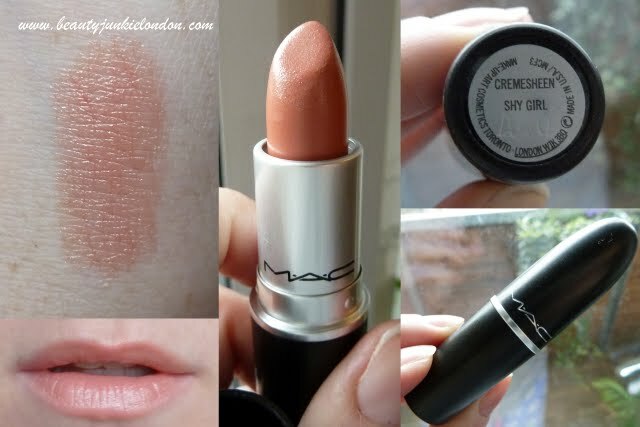 I recently picked up a second MAC lipstick for my fledgling collection. I picked up the peachy toned ‘Shy Girl’ a cream sheen formula. Now, I don’t know my MAC formulas all that well, but I’m not sure how I feel about this one. I *think* I like it, but I’m just not sure. It doesn’t seem to sit that well on my lips, maybe my lips are dryer than the feel or something – but there’s something about it that I’m not quite sold on. It might be that there is a bit of shimmer in it that I find leaves a bit of glitter behind when the colour wears off. But with a bit of balm/gloss and it’s fine. Colour wise though I really like it. Despite the peachy colour being more ‘summer’ I find this one really easy to wear now the weather has turned a bit colder. Not sure why exactly, but think it’s a flattering colour now my skin a bit paler (still want to get back on the fake tan a bit… need to find time). It’s an easy, safe colour I can just slap on. So now as far as MAC lippies go I have this one and Angel. What should I try out next??? i love shy girl! def an easy color to wear! I love Creme cup (cremesheen) or Plink(frost i think). I quite want to get a warm, rosy red colour for winter. Something a bit like Revlon’s Cherries in the Snow… that will suit a pale skinned blonde? Any ideas…? Brave Red and Ramblas Red are both gorgeous. I also just got Modesty, which is a really lovely mid-pink colour. Blankety is a Amplified lipstick and has a nicer consistency than the creme sheen ones in my opinion.. I think I prefer most of the Apmlified ones, nice and rich on the lips..